DALLAS and MANRESA (Spain), Mar 18, 2012/ — With (RED)’s goal of delivering an AIDS free generation by 2015 foremost on their minds, Spanish jewelry brand, TOUS, has joined forces with (RED) to create a special edition (TOUS) RED bracelet in support of (RED)’s fight against AIDS. The bracelet, a Vermeil Sterling Silver disc on a red nylon cord, will be available for purchase in all TOUS stores worldwide beginning March 6th. With each purchase of the $119USD (TOUS) RED bracelet, TOUS will contribute 5% of the sale to the Global Fund to Fight AIDS. 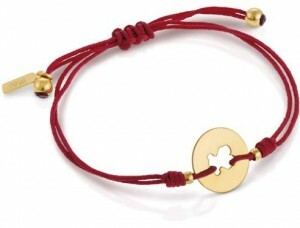 The bracelet, a Vermeil Sterling Silver disc on a red nylon cord, features TOUS’s iconic bear. This bear is not only the brand symbol of TOUS, but also a simple and strong symbol of hope and love. his family-owned company has evolved into a global lifestyle brand with its jewelry, accessories, watches and fragrance collections. Today, the Barcelona-based company is present in 45 countries with more than 400 stores in cities such as New York, Mexico or Tokyo.